The Science of Attraction: Can You Really Quantify Beauty? Back in college, when I was just a lowly intern at an online magazine in New York City, I was assigned to write a story called "10 Weird Things That Turn Men On." The story listed qualities like wearing red, smelling like pumpkin pie, and having full hips as scientifically proven to attract male partners to female partners. When my editor first instructed me to put together a roundup of peer-reviewed studies demonstrating an evolutionary basis for the attractiveness of different physical traits, I thought I would be holed up in my school library, digging through academic papers for weeks. But I was wrong. There were dozens of these studies, and they were shockingly easy to find—a sign that the science of attraction is evidently at the top of even the world's smartest minds. For example, I found a 2007 University of California, Santa Barbara study revealing that thicker hips and thighs might be considered more attractive because the fat in these areas contains omega-3 fatty acids, which could pass from a pregnant woman to her fetus and nourish its brain. (Translation: Big hips, good breeding material.) Three years later, scientists at the University of New South Wales in Sydney, Australia, found that after a series of tests, men consistently rated women with long, thin arms the most beautiful. Around the same time that my story was published, other magazines started reporting on the same topic. AskMen.com found a study from the University of Louisville in Kentucky showing that men find women with mouths that take up 50% of the width of their face to be the most attractive, as full pouts have been linked to "long-term health and reproductive potential." The same story reported that men in Western culture are most drawn to women with a waist-to-hip ratio of precisely 0.7, an indicator of healthy weight and ability to support childbirth. A Redbook.com piece referenced a 2008 survey from The Scandinavian Journal of Psychology demonstrating that men rate brunettes higher on the attractiveness scale than lighter-haired women. "Gentlemen don't, it turns out, prefer blondes," the article said. Objectively, I understand why stories like this do so well on the internet: Motivated by ego and self-loathing, we're all curious to know what physical features are considered the most beautiful so we can see if we measure up. What's less clear to me is why some of the most highly educated psychologists at some of the world's most esteemed institutions would dedicate such energy to a topic as seemingly frivolous as physical beauty. It makes one wonder: What is the motivation for these studies? Are they conducted in a biased or problematic way? And ultimately, is "quantifying attraction" even scientifically useful or just another reason for us all to feel insecure? To find out, I consulted a psychologist, a couples therapist, and a wellness expert to get their impressions of these studies and ultimately to provide an objective answer to the question: Are people with certain physical features quantifiably more "attractive?" In investigating the potential benefits and drawbacks of attractiveness studies, the first question that came to mind was this: What are the methods used to conduct them? According to New York psychologist Sanam Hafeez, PsyD, these studies typically require participants to look at a series of images and rate which they find most appealing. Already, though, there's bias here. I'll address the big, heteronormative elephant in the room: Most of the studies I found, as well as those reported by similar magazines, were authored by men and focused specifically on what men like in women. Though some studies on what women find attractive in men do exist, you'll be hard-pressed to find such a wealth of research investigating the attractiveness of women to other women or men to other men. Heteronormativity aside, it's also suspiciously difficult for a reader to tell who finances these studies and what their intentions might be. "These studies are generally funded by people or establishments who have agendas, even in academia," comments Caleb Backe, a certified personal trainer and wellness expert for Maple Holistics. At best, the studies end up biased due to the inevitability of human randomness and error, but it's also worth considering the very real potential that companies with commercial motives might be involved in their production. "Purely speculatively, I would be curious to know who funds these kinds of studies," ponders Fran Walfish, PsyD, a Beverly Hills family and relationship psychotherapist and author of The Self-Aware Parent. "Are they promoted by the fashion industry, diet industry, or low-cal food companies? The initial motivation for conducting a study devoted to women's physical attractiveness should also be called into question. Why dedicate such resources to this topic specifically? Thinking optimistically, Backe says, "It goes back to the eternal question of what constitutes beauty. It has been talked about for thousands of years in novels, paintings, poems, music, song, dance, sacred/liturgical writing, etc., and we still don't know precisely why it is that we do what we do." The bottom line, Backe says, is that we have a sociological desire to know what traits have been considered consistently attractive over time and what they say about our culture. Backe adds that there might also be an evolutionary motivation to understanding what attracts heterosexual couples. "Technological advances notwithstanding, the survival and continued existence of the human race (which is at war with bugs and other species) is highly dependent on us finding an attractive mate and procreating," he explains. "It is in our nature to want to look more attractive and increase our chance of participating in the big game of humanity." Wanting to look attractive may be "in our nature," but Hafeez and Walfish are still skeptical of this rationale, arguing that as far as these studies are concerned, sociological curiosity and a drive to advance the human species take a back seat to plain old-fashioned hunger for publicity. "I think [female attractivess] is a hot topic that gets media attention," says Hafeez. "Universities and other sources conduct studies to get data they then can promote in the press." Still, even when bias and shady agendas are minimized, it's worth asking whether or not attraction can really be quantified and how useful that quantification is. Hafeez, Walfish, and Backe agree that while these studies' results may be legitimate, they're by no means universal. In addition, they can be as harmful as they are informative. "While there are benefits to the data, studies like these fail to capture the fact that attraction varies from person to person, and it may cause women to think poorly of themselves if they're not what research deems optimal," says Hafeez. Not only that, but feeling drawn to one certain physical feature or another is only one small part of the complex puzzle that is human attraction. Scent, voice, energy level, intelligence, values, and personal experience are all at play, too. "While there certainly is a physiological side to determining attractiveness, there are many other factors to consider," says Hafeez. Consider the fact that the experiences we have during early childhood serve as mental imprints that influence what we'll be attracted to in the future. 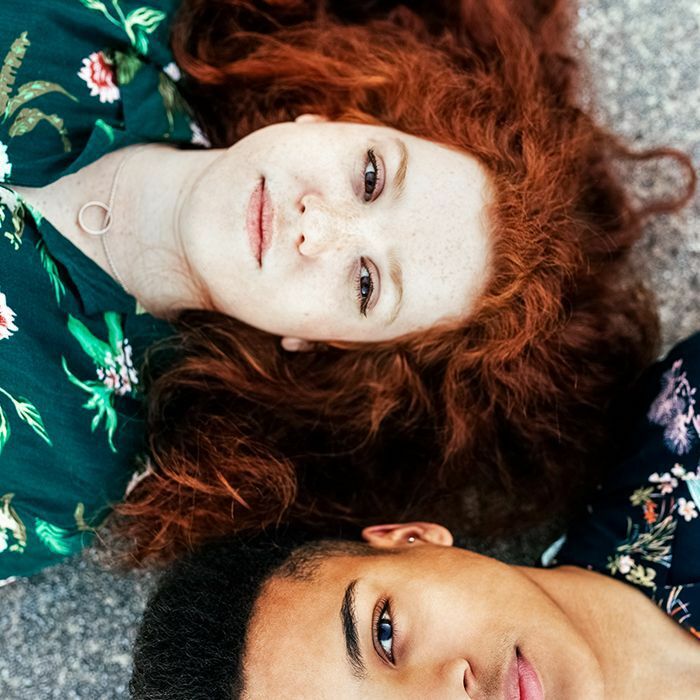 "For example, that 30-year-old guy who has a thing for redheads may have become attracted to redheads after having a redhead for a teacher in the third grade, the same year his parents divorced," Hafeez explains. "He found his teacher to be a comforting mother figure to him and from that point on always focused on redheads." To further complicate things, what we go through later in life can "rewire" those neural pathways. "Let's say that same 30-year-old enters a relationship with a redhead who breaks his heart, cheats on him. That emotional trauma can cause the man to have an aversion to redheads and vow never to date another redhead ever again. He'll begin to find them unattractive," Hafeez continues. I dare a study on hair color and attraction to account for all that baggage. If science is genuinely interested in quantifying attraction, experts think institutions should focus more of their attention on internal qualities like kindness, honesty, and self-respect. "These character traits are what creates the bright shine in a human being's eyes that we are most powerfully drawn to," Walfish says. "The fact that we focus our time, energies, and money on physical attractiveness simply perpetuates the inherent problem of America's focus on external beauty. … Age deteriorates physical attractiveness. Inner beauty remains." Here at Byrdie, we know that beauty is way more than braid tutorials and mascara reviews. Beauty is identity. Our hair, our facial features, our bodies—they can reflect culture, sexuality, race, and even politics. We needed somewhere on Byrdie to talk about this stuff, so… welcome to The Flipside (as in the flip side of beauty, of course! ), a dedicated place for unique, personal, and unexpected stories that challenge our society’s definition of “beauty.” Here, you’ll find cool interviews with LGBTQ+ celebrities, vulnerable essays about beauty standards and cultural identity, feminist meditations on everything from thigh brows to eyebrows, and more. The ideas our writers are exploring here are new, so we’d love for you, our savvy readers, to participate in the conversation too. Be sure to comment your thoughts (and share them on social media with the hashtag #TheFlipsideOfBeauty). Because everybody gets to be heard here on The Flipside. Are These Mysterious Contacts the New Anti-Aging Secret?